This well appointed conference room overlooking the Glen Park, is ideal for conferences, meetings, community activities and events. At 90 square Metres. it is capable of catering for up to 75 delegates. It is ideal for launches, special events and training courses. It is wheelchair accessible and is located next to the coffee dock, offering catering facilities for functions. Contact Us For Weekend Rates. The Activity Hall can cater for a multitude of activities from indoor sports to larger conferences, launches and special events. At 180 square metres, it has the flexibility to provide space for a wide cross-section of activities. 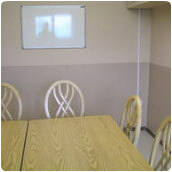 Our comfortable meeting room is ideal for meeteings and smaller training sessions. It is capable of catering for 12 delegates, board room style. This room offers a calm and relaxing atmosphere away from the busy day to day environment encouraging a productive, un-interrupted meeting.